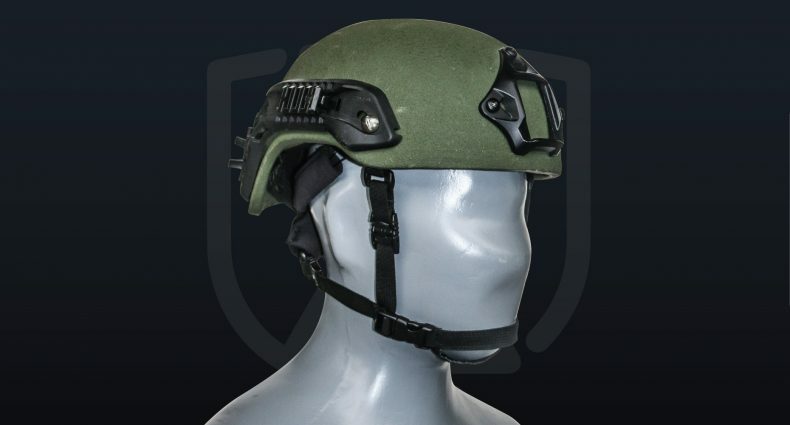 Special purpose ballistic tactical helmet DH MK-III is designed from composite material and ensures the protection of 7,62X25 mm caliber TT cartridges deterrence. The main purpose of the helmet is to deter the debris of artillery projectiles. In the inner part of the helmet there is absorbers for dampening kinetic energy, which protects the fighter’s head and neck from secondary damage. In the right and left side of the body there is installed Picatin type director rails which enables to install different auxiliary accessories on the helmet. In the frontal part of the helmet there is a special lath for installation of night vision goggles. Above mentioned modification helmet is intended for special use together with headphones, for what the special place is left around the ears.